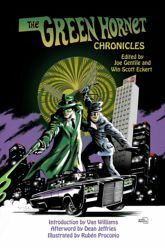 Moonstone is proud to present The Green Hornet Chronicles, the first anthology featuring all-new, original crime fiction tales of the man who hunts the biggest of all game, public enemies that even the FBI can't reach! It's the mid 1960's, the political climate is shaky, there's civil unrest, freedom and equality issues erupt everywhere from film to music to out in the streets. On police records, the Green Hornet is actually a wanted criminal, a master manipulator, a crime boss who has his fingers in every pie. In reality, The Green Hornet is actually Britt Reid, owner-publisher of the Daily Sentinel. His goal is to destroy crime from within by posing as a criminal himself. And who can forget Bruce Lee's introduction to American audiences with his turn as Kato in the 1967 Green Hornet TV show? Kato is not only is a martial artist of unsurpassed prowess, but a skilled driver, and educated engineer as well. *A story fragment by Harlan Ellison, as he teams the Green Hornet up with The Phantom! *noted writer who is known for his work on the Green Hornet- Ron Fortier has a new stories in this volume! *An introduction by TV's Green Hornet, Van Williams! *An afterword by the man who designed and built the Black Beauty, Dean Jeffries! Written by: Harlan Ellison, Greg Cox, Robert Greenberger, Ron Fortier,Will Murray, plus many more! 336 Pages. Black and White. Squarebound. 6" x 9"